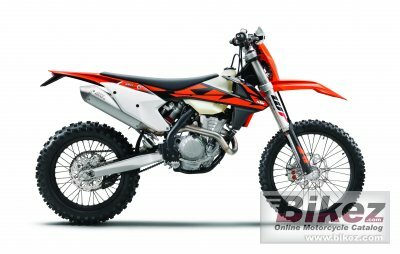 2018 KTM 350 EXC-F. Picture credits - KTM. Submit more pictures. The centerpiece of the compact DOHC engine is this cutting-edge cylinder head. It features light, dual overhead camshafts with friction-optimized cam followers boasting a hard DLC coating. Four lightweight titanium valves and high-flow ports maximize the flow rate for an optimal power band and outstanding performance across the seemingly endless rev range of 12,800rpm. Ask questions Join the 18 KTM 350 EXC-F discussion group or the general KTM discussion group. Bikez has discussion forums for every bike. View comments, questions and answers at the 2018 KTM 350 EXC-F discussion group. You can sign up for e-mail notifications when other riders answer you. If you have extensive experience with the MC, please send us a review. If you consider buying this bike, you should view the list of related motorbikes Look at photos. Compare technical specs. And check out the rating of the bike's engine performance, reliability, repair costs, etc. You can compare the rating with other bikes.